The original Strathmore Primary School building, erected in 1943-44 and then rebuilt following a fire in 1945, is a gable-roofed red brick school building on an elongated T-shaped plan. Set well back from the street, its symmetrical facade is echoed by a matching brick gateway along the southern property boundary. The Strathmore Primary School is of historical and aesthetic significance to the City of Moonee Valley. Historically, the school is significant as one of a very small number of new government schools that were established during the later years of the Second World War, when labour and materials were restricted even if the budget of the Education Department was not. 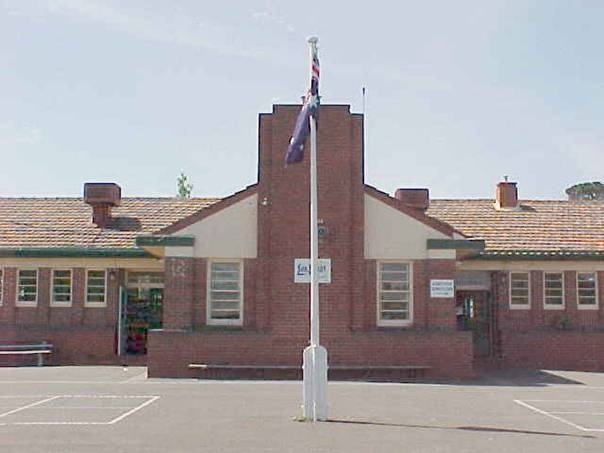 The school was also one of the last new schools to be built in Victoria in the long-established and traditional form of a substantial brick building, in contrast to the more utilitarian and standardised designs, often incorporating prefabricated elements that would characterise new government schools from the late 1940s onward. At the local level, the school building is significant as one of the first buildings to be erected during the second wave of development that spread through Strathmore, particularly in its northern portion, from the early 1940s. This second and more intensive phase of settlement, which followed the more piecemeal development of the area in the 1920s and '30s, saw the suburb fill out into the form that still strongly characterises it today. Aesthetically, the school is significant as a unusual hybrid design. It combines the Palladian planning, composition and symmetry that characterised Victorian school buildings in the 1920s and early 1930s with elements of the Moderne style that became ubiquitous in the later 1930s. The latter is particularly evident in the horizontal emphasis (window boxes, glazing bars, etc), the stepped chimney element and the splayed window reveals. The matching brick gateway, on the Lloyd Street frontage, is an important contributory element. The original portion of the Strathmore Primary School is a single-storey red brick building on an elongated T-shaped plan, with a shallow gabled roof clad in glazed terracotta tiles, and a narrow skillion-roofed wing along the street frontage. This facade has a projecting central bay with rendered gable end and broad chimney breast flanked by windows. The flanking wings are articulated by manganese brick stringcourses and bays of multi-paned casement sash windows with distinctive steep sloping sills and continuous brick planter boxes with brick-on-edge coping. There are half-glazed multi-paned doors and, at the eastern end, a recessed porch with steps up to the administration entrance. On the street is a gateway in matching red and tapestry brick, comprising squat piers and a pair of curving dwarf walls. The main school building is in excellent condition. The main school building is substantially intact; the administration entrance at the western end of the building has evidently been altered.